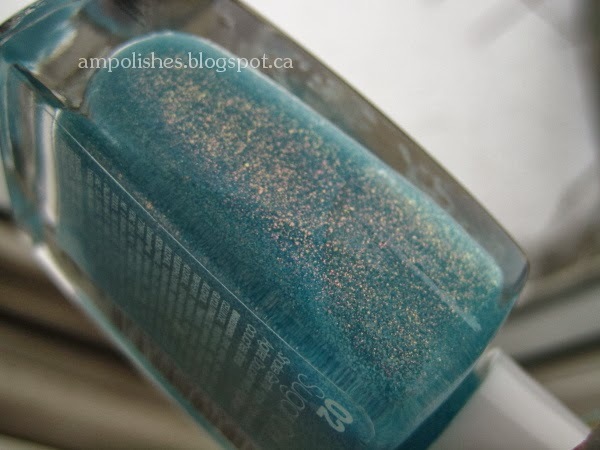 Awhile back Mir reviewed the Sally Hansen Sugar Coat Collection (post can be read here). Sally Hansen will be releasing a collection called Sugar Shimmer, a textured polish with a shimmery effect. "New candy-coloured nail polishes that dry to a 3D matte finish for nails that look like they're delicately coated with sugar crystals." The collection will consist of 6 new shades. Sally Hansen describes this collection as..."A breakthrough formula that gives nails a sugary texture special effect with light-reflecting, multidimensional shimmering finish." Today we have Sugar Cloud and Work Of Tart to share with you all. Click to see the colours up close! Sugar Cloud is a iridescent blue with shimmer that glows a golden green or purple blue depending on the angle you look at it. The polish reminded me of a textured version of Models Own Indian Ocean. I found the first layer to be extremely sheer and I had to use 3 layers in the swatches below. 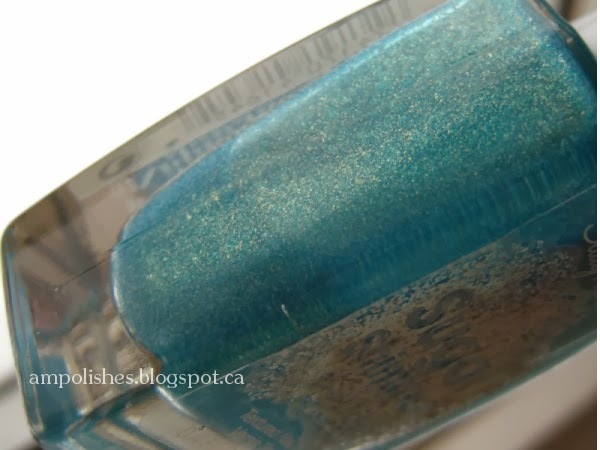 Work Of Tart is a dark teal that glows a golden shimmer. The first layer was on the sheer side as well but was very buildable and could pass off as opaque with the second the layer. For the swatches I did three just in case since I was taking pictures in the natural light. Each polish is 0.4 fl oz / 11.8 ml in size and priced at $7.95 MSRP. The collection will be released February 2014 and will be available in most drugs stores across North America. So what do you guys think...are you a big fan of the textured polishes trend? Any favourite brands that make texture polishes? Let me know what you think!